This report offers the perspectives of global real estate investors on the theme of risk management. 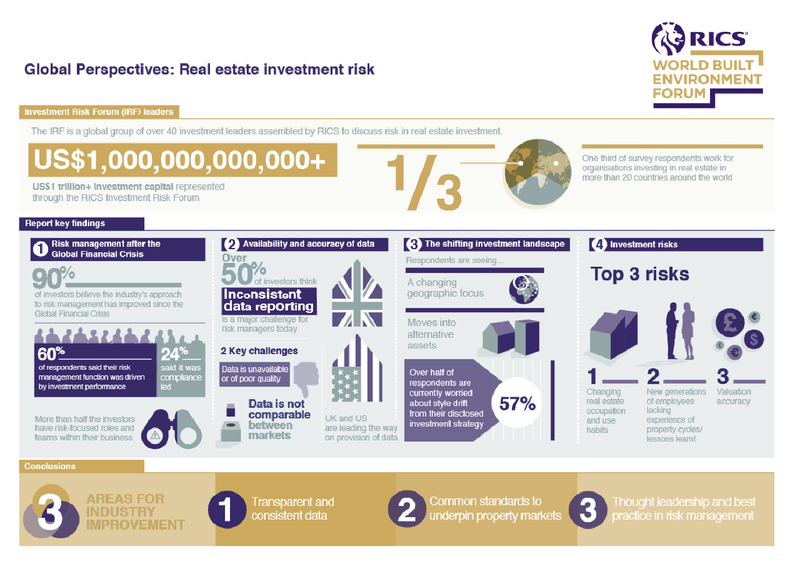 It is based on the insights of the RICS Real Estate Investment Risk Forum (IRF), a network of more than 40 senior investors from many of the world’s largest real estate investment businesses. Collectively, members of the IRF and their firms represent more than US$1 trillion in real estate Assets Under Management. The group was established in 2015 to foster industry leadership and to share best practice, with the aim of enhancing the industry’s approach to risk management. This report, the first by the group, draws on responses to an anonymised sentiment survey along with follow-up interviews. Further context is drawn from IRF roundtables, which have been held regularly in London, New York and Singapore since September 2015. The report aims to highlight some of the trends and perspectives which influence risk management in real estate investment. It is designed to stimulate further discussion and to act as a foundation for ongoing leadership in this field. The 2007/8 Global Financial Crisis remains in the minds of investment managers, prompting an increased focus on risk management over the last ten years. However, investors are balancing this with a need to achieve returns. With some investors believing that we’re nearing the top of the cycle, several are moving further up the risk curve to achieve them. Despite global property investment volumes reaching all-time highs in 20152, the findings highlight a lack of quality benchmarking data in many markets. More than half the respondents agreed that inconsistent property data reporting is a major challenge today. A particular concern was its impact on their ability to accurately compare asset, portfolio and fund-level performance between countries. A move into alternative assets. These trends have come about for many reasons, including a changing risk appetite among their investors and a willingness to seek higher returns in non-traditional assets. Changing real estate occupation and use habits. New generations of employees lacking experience of property cycles/lessons learnt. Facilitate industry-leading discussions on the potential of the 21st century's people and places. Greater accessibility to indices that can enhance benchmarking and the ability to manage risk prudently. Data sets such as total returns are available in some developed markets but there is a need to capture this information more systematically around the world. Common standards that underpin real estate information would ensure property data is more transparent, comparable and meaningful across markets, to allow better informed decisions on investment risk. Some international standards exist today, including international standards for valuation (IVS) and property measurement (IPMS), but more can be done to encourage the use of these standards and ultimately create greater market confidence. The industry needs to share innovative thinking, market insight and best practice. As a priority, we need to share lessons with new generations of employees, in particular on liquidity management; integration of research in the risk management process, and practical approaches to risk management.